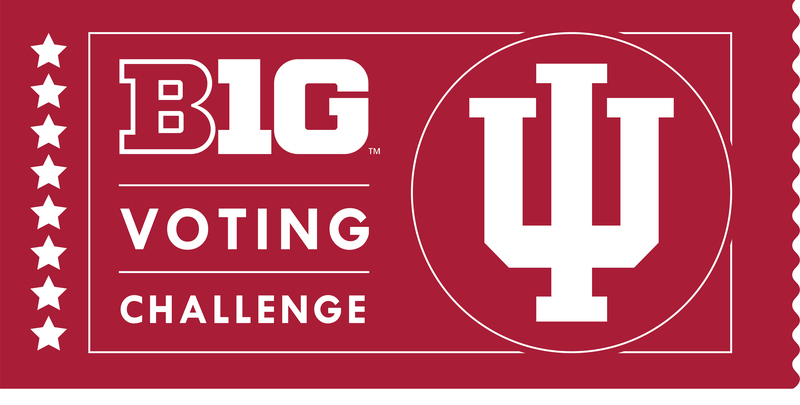 The goal of Indiana University Bloomington's (IUB) Big Ten Voting Challenge is to increase student voter registration, non-partisan education, and voter turnout in November 2018 and beyond. IUB's efforts to enhance student-citizens is part of the nationwide Big Ten Voting Challenge (BTVC) through which Big 10 schools are engaging in a friendly competition to see which campus rises above the rest in two areas: First, there is an award for the greatest percentage voter turnout among eligible voters on campus. Second, there is an award for the biggest improvement in voter turnout. If you have questions about the BTVC or PACE, contact our office at 812-856-1747 or pace@indiana.edu. Sign Up For TurboVote Today! As IUB's BTVC gears up for an active and engaging semester to educate all students on the importance of voting and accessing reliable well-rounded candidate information, we also support students in overcoming barriers to voting and to teach guidelines to successfully cast a ballot. Our goal is to do our best, in all ways, reaching out campus-wide and especially to minority populations, to increase electoral participation. We aim to create a more informed, engaged, and active pool of student-citizens who understand the nuances of the voting process more fully, and who are skillful at educating themselves about all candidates and issues on the ballot. We seek to motivate students in these important ways to make a difference at the polls. Come back later to see new events. The Office of the President, the Office of the Provost and Executive Vice President, the Political and Civic Engagement Program (PACE), and the Indiana University Student Government (IUSG).